* Assault pilot gloves offer both soft and flexible feel. 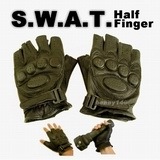 * Half finger design offer real feel with your fingers during airsoft game. Or simply for general use! looks ultra cool!! * Made by leather, PVC and nylon fiber. * Anti slip material on palm side of the glove. * Reinforced ABS knuckle area. * Reinforced palm area with high quality comfortable cushion padding. * With adjustable velcro strap. 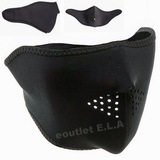 * Perfect for paintball and outdoor war game activities. Buy this item and earn 33 points valued at $2.62(inc GST).